on my way to bring rare blood to a rural hospital. 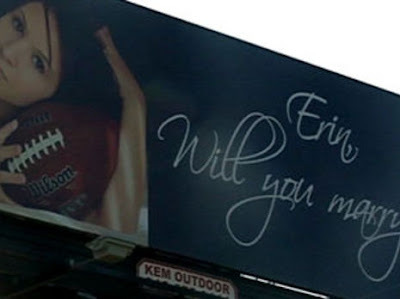 ERIN, WILL YOU MARRY ME? I sped by, thinking I would never know who this Erin was, or who was doing this unique proposal, or if she said yes. I arrived to the hospital to see, that in a week's time, the TACO BELL had been leveled to the ground. Being a writer, I asked around at the hospital. TACO BELL was being re-built from the ground up. But what happened to the poor people depending on those paychecks to survive? Being a writer and observer of the folks around me, I knew most of the people displaced. They were not faceless statistics. They were single mothers and struggling teens who would be devastated. And I would never know what happened to them. Why do people scream at each other in an argument? Do they instinctively know that the other person has long since stopped listening? Where does the love go in so many marriages? Is it evaporated under the heat of life's day-to-day burdens? Or is it strangled by neglect, by meant-to gestures of caring forgotten in the rush of the rat race, and the poison of familiarity? It can't be data storage, or a computer would be conscious. Is it that something science scoffs at? The soul? Don't ask a mother this. You can see for yourself when she walks into her son's room unexpectedly. But a mother will never know what impact her life of love, her words of wisdom will have on her children when she is dead. Perhaps sometimes you just have to trust in love to stick when all else drops by the wayside. Whew! After midnight, and I'm still at work! I really need like a Girl Scout pack to buy THE LEGEND OF VICTOR STANDISH, post a review, get those 5 entries, and maybe me onto the Top 100 so I can support myself without these terrible hours! LOL! We all have our dreams! But I wouldn't be adverse to one or two of you guys posting a review. The avalanche of prizes aren't too shabby you know. I'm off to my apartment in exile. Hope you enjoy this post. Hi Roland .. at times when we're struggling ourselves we have to count our own blessings - everywhere I go to there's closed businesses and closing ones .. I can't let things affect me - it brings me down .. I can only know that when I have more I'll be helping others ... for now I'll give as much cheer as I can to other residents at the Nursing Centre .. Very good points you've raised - I only know I need to be as capable as I can in my own circumstances, while being aware of the outside world. Roland, you sure know how to ask the tough questions don't you! If the entries don't, I'll just take it as a sign to walk off with Hibbs into the sunset. But I have a few promises to keep before then. Like you said, there are so many areas where our help is needed. Sometimes just an understanding smile can be the difference in a good day or a bad one to a hurting heart. And we are blessed in so many ways that slip by us because they have become part of our lives. It can be scary when we see the storm clouds on the economic and political horizons. Hi Roland .. thanks - but preferably don't walk off into the sunset with or without Hibbs! The tough questions come to me as I drive down lonely roads at night, bringing rare blood to ill patients. I think of all the heartbreak I see in the lives of those I work with. Hibbs, the bear with 2 shadows, just sat down on his big rump, saying, "I'm not going anywhere, buddy. You fight the good fight, hear?" Thanks for the support. Good points, Roland. For now, just listen to Hibbs. Excellent questions. Definitely something to ponder. I hope your work hours improve soon.